The title of this film, the makers remind us helpfully, means obsession. But the only obsession that Junooniyat demonstrates is with giving romance a bad name. The film tells the same old pappy, pulpy story of a pair of young lovers up against sundry pyaar ke dushman. The latter category is, predictably, personified by a father who thinks he owns his daughter and an unsuspecting NRI bridegroom who walks into a wedding ceremony, family in tow, blissfully unaware that the bride isn?t dying to tie the knot with him. That is how original Junooniyat is. It resorts to fluffy poetry and screechy songs to heighten the intensity of the love between an army captain and a college girl. The result in terms of dramatic traction is zilch. The lovebirds, on their part, yo-yo between overwhelming passion and outright inanity as they struggle to get their lives in order. In one scene, the unwanted suitor who wings in from Canada (Gulshan Devaiah in a special appearance although there is little that is special in the half-baked character) is on a Ferris wheel with the girl he is supposed to wed.
We will go up and we will come down but all will be fine, he assures his would-be wife. Had the subject been Junooniyat, he would most definitely have left out the bit about going up and being fine. The only direction that this film travels in is down. Here is how and why. Amritsar girl Suhani Kapoor (Yami Gautam) slinks away from a Christmas camp in the Himalayas and goes for a swim in a hot sulphur lake. She loses her bearings for no apparent reason. 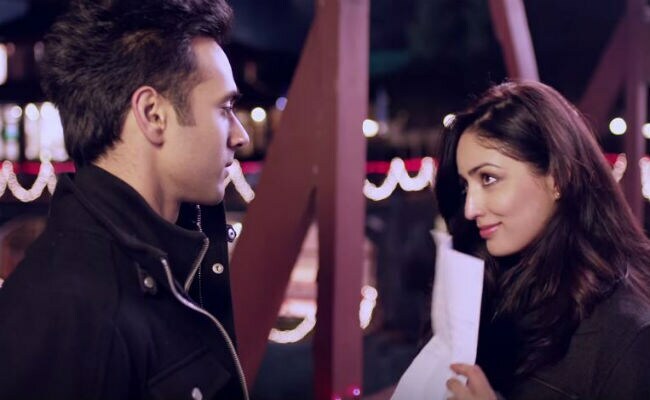 Army captain Jahan Bakshi (Pulkit Samrat) stationed in Sonmarg comes to her rescue even though the lass seems to be perfectly hale and hearty when help arrives. She is neither in danger of drowning nor is she in any kind of apparent pain. Lo and behold, she is fished out of the water like a well-rested mermaid. I am a college swimming champ and belong to a family of three martyred soldiers, Ruhani preens before the colonel who summons her for questioning. But so what, the distress call is a good pretext to bring the hero and the heroine together so that a love story can be stitched together. To take the story forward, Ruhani is hauled up for trespassing into a restricted military area. She is detained in the army camp for the investigations into her antecedents to be completed. She accuses Jahan of manhandling her during the rescue operation and demands an apology from him. That is, plainly, another contrivance to allow her and the soldier that she has the hots for to follow each other around, share the dance floor at a X-mas party, get to know each other better, and vow to spend the rest of their lives together. But before Ruhani can return home, she jumps into another water body for as flimsy a reason as anything else this film can throw at us by way of dramatic logic and ends up in a command hospital. But up ahead are impediments that are much worse. And the solutions that the screenplay comes up with for every problem that the lovebirds face are hare-brained. Jahan does not believe in destiny. Meri zindagi mein joh bhi hoga meri marzi se hoga, he intones grandly. The heroine, on the other hand, is told bluntly by her tractor dealer-dad that she will never be allowed to take her own decisions. Many complications, a whole bunch of misunderstandings, a big fat Punjabi wedding in Patiala, a series of song-and-dance set pieces and buckets of tears later, Junooniyat lurches its way to a spectacularly ludicrous climax. That is par for the course. Directed by Vivek Agnihotri and produced by the very people who foisted the previous equally brainless Pulkit Samrat-Yami Gautam vehicle upon us (Sanam Re? ), Junooniyat thinks nothing of wallowing in a sea of silliness. Rattling off a bunch of names of inhabitants of her city who made it big, including Kiran Bedi, Kapil Sharma and Sidhu paaji, the heroine asserts that Amritsar has no dearth of ?smart people?. Ruhani definitely isn?t one, given the way she keeps getting into trouble with the army and with her family. Her college mates seem to be just as daft. One of them tells her that there is nothing that is ever wrong in love. Even a clock that has stopped shows the right time at least twice a day, she explains. Do not ask what the connection between matters of the heart and clockwork is! Jahan is more than just a brace soldier. He pens mushy poetry to woo his girl. He thinks no end of his versification skills. Every poem has words, but not all words are poetry, he declares to Ruhani. Absolutely, all cinema has scenes and images. But not all scenes and images are not cinema. Pretty frames do not a film make. It isn?t that the pursuit of cloying sentimentality does not sometimes yield pleasantly surprising results. But don?t expect any such miracle from Junooniyat.